November 10th through January 19th Midtown Manhattan, IMX Pilates, 265 Madison Ave, 2nd Floor (39th Street & Madison Avenue). What if you were following a plan for your money that you KNEW worked? 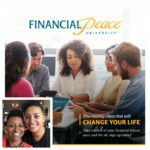 With Dave Ramsey’s class Financial Peace University, you CAN take control of your money, get out of debt, and create a plan for your future. If you’re interested in learning more about the class and to register follow this link: https://fpu.com/1075718 or stop by the Information Table at Sunday Service to find out more!